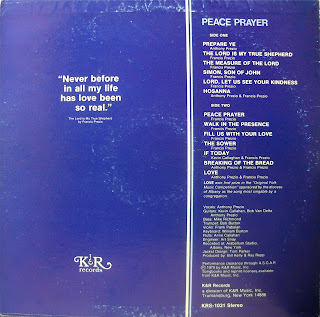 From Ray Repp’s small K&R label comes this fine folk recording in the melodic Catholic style. Anthony furnishes guitar and lead vocals while Francis appears to be listed for being the primary songwriter. Mostly an acoustic emphasis arranged varyingly with flute, harpsichord, violin and trumpet. From meditative folk to baroque classical moods to majestic praise anthems. Even a couple country moves on the fiddle-led ‘Simon, Son Of John’ and the electric ‘Walk In The Presence’. Their song ‘Love’ won first prize in an original folk music competition. Produced by Bill Kelly and Ray Repp – K & R? (The Archivist by Ken Scott, 4th Edition).